Are You a Bad Yogi? Every day I get emails from people all over the world telling me their stories of how they came to know Bad Yogi and how the small change of adding a few minutes of daily yoga has profoundly changed their lives. What I love even more is that these people are not always (or even often) lifelong yogis, athletes, gymnasts or anything else that might predispose them to pick up something like yoga. They’re stay-at-home/working moms (sometimes of 4 or 5 children! ), burly “manly” men, college students on a budget, retired men and women, veterans— you name it. They come from the farthest corners of the world… everywhere from Canada to Congo, New Zealand to the Netherlands, Hong Kong to middle-of-nowhere Ohio, and everywhere in between. I’ve seen people rock Bad Yogi tanks in the North Pole, Alaska (didn’t even know that was a real place!) and at Mount Kilimenjaro. I hear how these classes and community have helped people feel less alone during an eating disorder recovery, chronic pain and illness, and other emotional hardship. I’ve heard how this community was there to help them celebrate a handstand victory or a 30-day stretch of daily yoga. I could never properly summarize all the amazing stories I’ve read and listened to since starting this journey. So when I get asked in interviews about who or what “inspires” me, I can’t imagine feeling more inspired by any guru, spiritual leader, entrepreneur, famous quote or meditation session than I do by all of you. Bad Yogi isn’t just me by myself putting on a cheeky label, it is ALL OF YOU. Every single one. I love that each of represents a different size, shape, color, orientation, style, belief system, diet, experience/level, motivation, background, etc… it’s all here. And when I say that I don’t care about any of that but you’re welcome here no matter what, I really mean it. And I love that all of you feel the same. I wanted to highlight some REAL yogis from our #badyogiarmy in professional ads because YOU ARE THE INSPIRATION. “Famous” yoga-celebrities are old news. Let’s see what it looks like in real life. I’m just a yoga teacher and I might be driving this train, but you guys inspire me to keep it rollin’. More of your features coming soon. Thomas A. 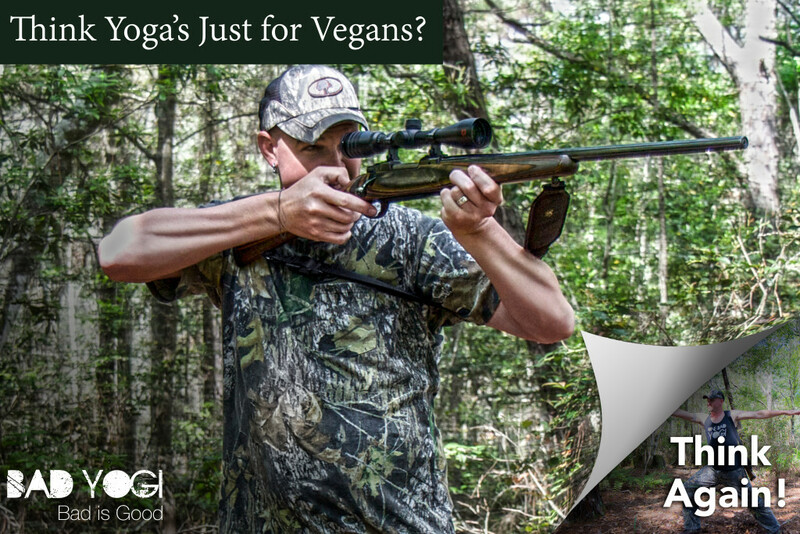 Southern gentleman, expert outdoorsman, occasional hunter, Bad Yogi. Matt Sydal. Pro-wrestler, world traveler, big thinker, Bad Yogi. Rachel H. Mom of 3, lifelong dancer, boo-boo fixer, Bad Yogi. you rock!!!!! Thanks for working as hard as you do to promote inclusiveness acceptance and YOGA! Thanks Erin for keeping it real…as part of the yoga community in south Florida, I have seen and heard just about everything that makes yoga competitive, look what I’m wearing, hand stand with one hand kind of practice. Please, please, please continue to do what you do, you are an inspiration. Yes, yes, yes! I am so over our preoccupation with what we can’t do, who we don’t look like, and/or what others think of us. It’s time to better serve our spirits! I love these graphics and everything about Bad Yogi—everything! I start my own YTT this fall and can’t wait to carry the Bad Yogi creed into my future classes 🙂 (I’ve already started spreading the love by forcing pretty much everyone I know to try your challenges and hop on the Bad Yogi train!) As a student and future teacher, thanks for being an incredible inspiration and so much fun to learn from. I find yoga instructors that can only use sanskrit annoying….just call the pose what it is in English, does it make it a better pose or you a better teacher to use words that no one knows? I enjoy your classes because they make sense and you use English! I legit reared up reading this. It’s so beautiful and honest. This is exactly why I jumped on the Bad Yogi train! REAL people doing yoga! I can vouch for Alyssa when she says she’s spread the word. It’s because of her that I started doing yoga at all, so I’m forever thankful for that. But then I checked out the site and the videos for myself and I was hooked for myself. The way you teach is THE best. I find that I don’t really enjoy the teachers who use Sanskrit because I feel like they’re putting on airs. Yoga is not some elite club. People shouldn’t be snotty about it. And I love these pictures because it shows how true the statement is that yoga IS for everyone. I really like that you started this blog. I started yoga recently not even a full year in yet. I am not even sure why I started, I think it was because I tried other forms of activity got bored or lost interest and yoga was just next on the list. I LOVE it! I actually look forward to doing yoga and now feel a sense that something is missing when I don’t do it. If for some reason I can’t fit in a yoga workout I find myself at least doing a pose or two at work or home. I didn’t feel like I could say I am a yogi only because for me it is not a spiritual connection, I am not the best of eaters although, I am trying, I still can’t do a lot of poses but, I am working on it, and I am not a vegetarian or vegan. I only do it because it makes me feel good when I am done. By that I mean physically and yes probably mentally too as that usually goes with the physical. I guess the best part of this blog for me is not only do I think you are a great teacher but, I appreciate your way of thinking by not being judgmental, understanding everyone has to start some where, and that yoga is not a competition but more of a personally journey and we all have different roads. I am looking forward to seeing where this new road goes. I love this! We do yoga in the living room (hubby and I together) and our three girls and pets are always all over us! Lol – makes you learn to focus for sure. LOVE LOVE LOVE this 🙂 You are so awesome and truly inspiring. You are right, too many people get caught up with what a yogi “should” do or be or look like and not on the actual point which are the benefits that yoga can bring to anyone who makes even a little bit of time for it regularly. Keep doing what you do, girl! Erin this is so beautiful!! Thank you for sharing this and making my Friday better than it already was. I love that you are so down to earth and real. You have continually remained that way, which is great! You are so humble and remind us that we are all beautiful spirits with unique gifts and talents to offer this world. Thanks again and keep being your bad self!! Don’t forget us stay at home dad’s! Thank you, Erin for all that you do! Your yoga flows are so easy to follow and I love that you give alternatives for newbies and less flexible yogis 🙂 you have helped motivate me to get in shape more and feel so much better about my body. I haven’t lost all the baby weight after having my daughter, but being able to keep up with you in your videos makes me feel good about my body and the things I am able to do with it 🙂 you’re amazing!!! Awesome words! This is a good reminder that yoga isn’t all about posting photos and “being the most flexible” or achieving some master pose. It’s about being who YOU are where you are in this moment, and finding your own peace and bliss. I love this and you so much! This is why you are my go to yoga instructor. I love how down to earth you are and the love and compassion you have for all your bad yogis! This is such a wonderful article. I feel the same as so many others do on here about you and your teaching. I love that I can do yoga in my living room and not feel I have to put on airs to fit in. I love the entire Bad Yogi mentality! Cheers! Thank you so much for keeping yoga real! I was looking at youtube videos trying to see if yoga was for me. I certainly don’t fit the “yogi” stereotype, but I was searching for something to help me be healthier. The Erin Motz approach to yoga inspired me. We all come to our mats just as we are. Erin, thanks for making me want to come back to my mat every day! I started yoga because it was the only exercise I could do with asthma. It took me a while to find someone that I related to. I found #badyogi completely by accident and knew after the first video of the 30 days of yoga I finally found someone real. One day if we meet you are going to get the biggest hug from me! Of course after that we will eat a steak and have a beer! On a more serious note, I am very impressed by your blog and your natural approach to yoga. I am 52 years old and have been practicing yoga most of my life. I have always taken the approach, “whatever works for you”. When people begin to understand that yoga is as individual as every snowflake, maybe all of the controversy can calm down. How many of you have been asked: “What kind of yoga do you practice?” I always say: “Universal”. You get some weird looks, buts that’s okay. Keep on your path Erin, we are following too! Hi Erin! Hope you’ll remember your “SENIOR” bad yogis. I’m 65 and can say with pride that I rock my Bad Yogi tee! Love following you, practicing with you and all the other incredible Bad Yogis out there, and especially sharing the same philosophy. Thanks!! 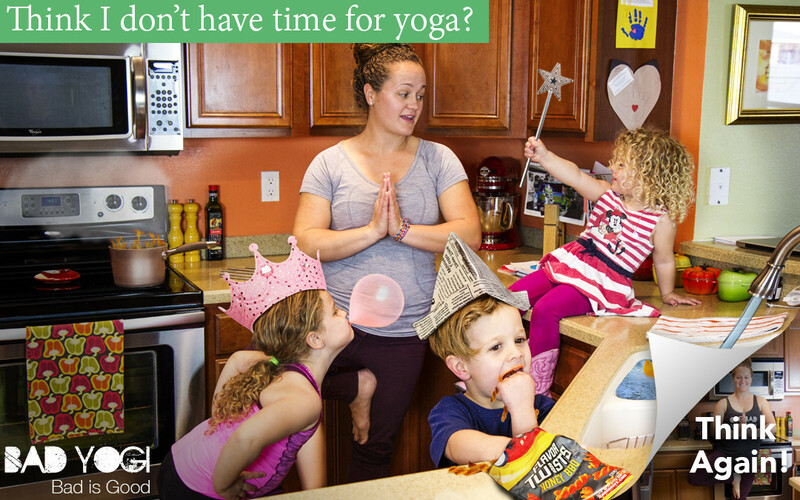 While reading this post, I thought to myself… How DID I find this bad yogi family? I’ve been following this movement since I found your 30 day yoga challenge w doyouyoga.com almost 2 years ago. what keeps me around is the welcoming, unique, and real community that you all make up… I love being a bad yogi. I love being able to be myself… Faults, imperfections and all… And still be encouraged and accepted! THANK YOU ERIN AND MY BAD YOGI FAMILY! 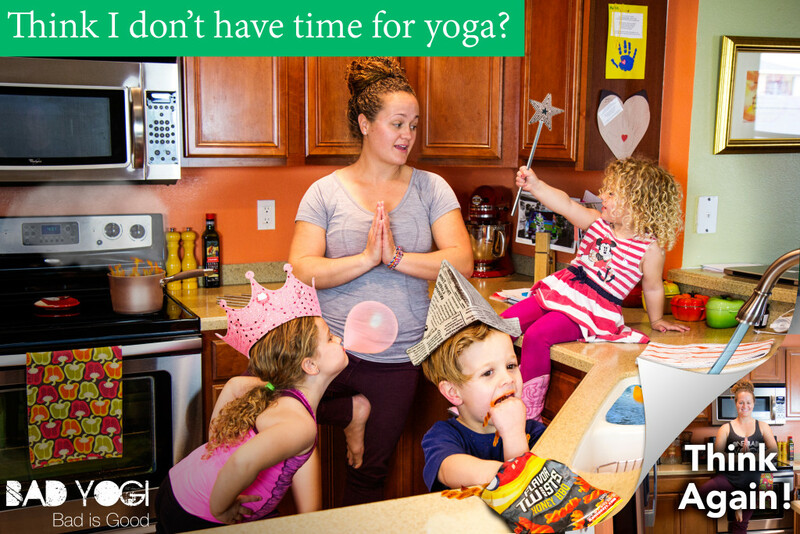 I am a working mom of 6 who found the love of daily yoga from your first 30 day yoga challenge. In fact I post one of your yoga videos daily on my facebook tagging several of my friends as we do a video a day together. We are all sizes and ages with different lives all over the world. I have posted other videos in the past but we always go back to Erin Motz. I am a Mom of 5 boys and 1 girl, pug lover, wife, Hairstylist, creator of knitted Lottie dolls and pals. I also love to write fiction novels. I run and I do yoga even though a thryoid issue doesn’t allow me to loose weightbut makes me gain like there is no tomorrow. I love all things active. If I can do it anyone can because I am not the typical yoga gal. I am however one bad yogi 🙂 Yoga took my boos boos away and running made me free! 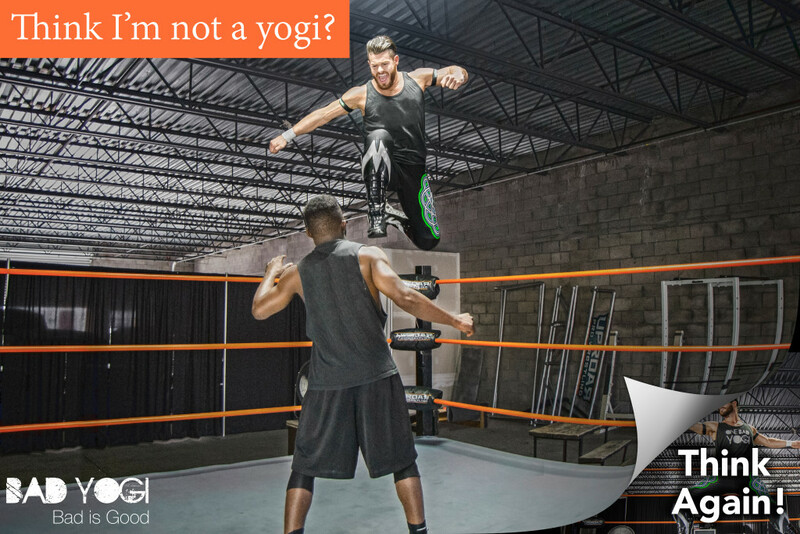 You should call yourself a: “REAL” BAD YOGI! I’m a part time art teacher on a huge budget….or lack of! ha I moved earlier in the year to a new city completely by myself. With all of my newly found alone time, I began to explore and expand upon all of the things I enjoy doing for myself. I found your 30 day challenge and stuck with it because of how thorough and bubbly you are. Since then, I have done just about every yoga video you have available! I feel great about my body and internal spirit. In recognition of national teacher appreciation week, I just want to say thank you for being such a wonderful instructor! You have truly changed my life for the better! I absolutely loved this post!! Thank you for keeping it REAL!